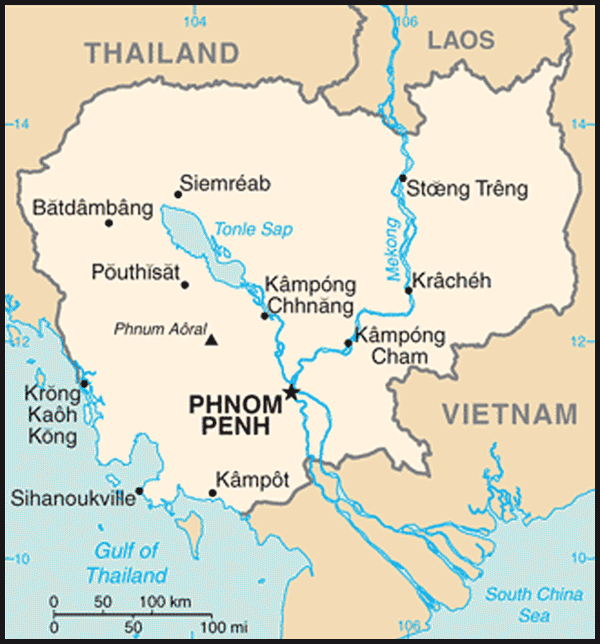 Cities: Capital: Phnom Penh (pop. 1.3 million), Battambang, Siem Reap, Sihanoukville, Prey Veng, Kompong Cham. Nationality: Noun and adjective — Cambodian(s), Khmer. Avg. annual population growth rate (2008 census) 1.54%. Health: Infant mortality rate: 58/1,000. Life expectancy — 59 years male; 63 years female. Ethnic groups: Cambodian 90%; Vietnamese 5%; Chinese 1%; others 4%: small numbers of hill tribes, Cham, and Lao. Education: Years compulsory: 9 years. Enrollment — primary school, 94.4%; grades 7 to 9, 33.9%; grades 10 to 12, 16.4%; and tertiary, 2.8%. Completion rates — primary school, 85.58%; lower secondary school, 49.05%; upper secondary school, 20.58%; university, 6%. Literacy (total population over 15 that can read and write, 2007) — 75.1% (male approx. 85%; female approx. 64%). Branches: Executive: King Sihamoni (head of state since October 29, 2004), prime minister (Hun Sen since January 14, 1985), 10 deputy prime ministers, 16 senior ministers, 26 ministers, 206 secretaries of state, and 205 undersecretaries of state. Legislative — National Assembly, consisting of 123 elected members; Senate, consisting of 61 members. Judicial — Supreme Court, Appeals Court, and lower courts. Administrative subdivisions: 23 provinces and 1 capital municipality. Political parties and leaders: Ruling parties — A coalition government of the Cambodian People's Party (CPP), led by Samdech Chea Sim; and the National United Front for an Independent, Neutral, Peaceful, and Cooperative Cambodia (FUNCINPEC), led by Keo Puth Reasmey. Opposition parties — The Sam Rainsy Party (SRP), led by Sam Rainsy; Human Rights Party, led by Kem Sokha. GDP (2010 est. ): $11.3 billion. Per capita GDP (2010 est. ): $830. Annual growth rate (2010 est. ): 5.9%. Agriculture (33.4% of GDP, 2009): About 4,848,000 hectares (12 million acres) are unforested land; all are arable with irrigation, but 2.7 million hectares are cultivated. Products — rice, rubber, corn, meat, vegetables, dairy products, sugar, flour. Industry (21.4% of GDP, 2009. ): Types — garment and shoe manufacturing, rice milling, tobacco, fisheries and fishing, wood and wood products, textiles, cement, some rubber production, paper and food processing. Services (39.8% of GDP, 2009. ): Tourism, telecommunications, transportation, and construction. Central government budget (2010 est. ): Revenues — $1.5 billion; expenditures — $2.2 billion; foreign financing — $825 million. Trade: Exports ($4.68 billion, 20010 est.) — garments, shoes, rice, cigarettes, natural rubber, pepper, wood, fish. Major partners — United States, Germany, U.K., Singapore, Japan, Vietnam. Imports ($6.38 billion, 2010 est.) — fuels, cigarettes, vehicles, consumer goods, machinery. Major partners — Thailand, Singapore, China, Hong Kong, Vietnam, Taiwan, United States. Economic aid received: $989 million in grants or concessional loans were disbursed in 2009. Major donors — Asian Development Bank (ADB), UN Development Program (UNDP), World Bank, International Monetary Fund, Australia, Canada, China, Denmark, the EU, France, Germany, Italy, Japan, Sweden, Thailand, the U.K., and the U.S.
Exchange rate (2010): 4,064 riel per U.S. $1. Ninety percent of Cambodia's population is ethnically Cambodian. Other ethnic groups include Chinese, Vietnamese, hill tribes, Cham, and Lao. Theravada Buddhism is the religion of 95% of the population; Islam, animism, and Christianity also are practiced. 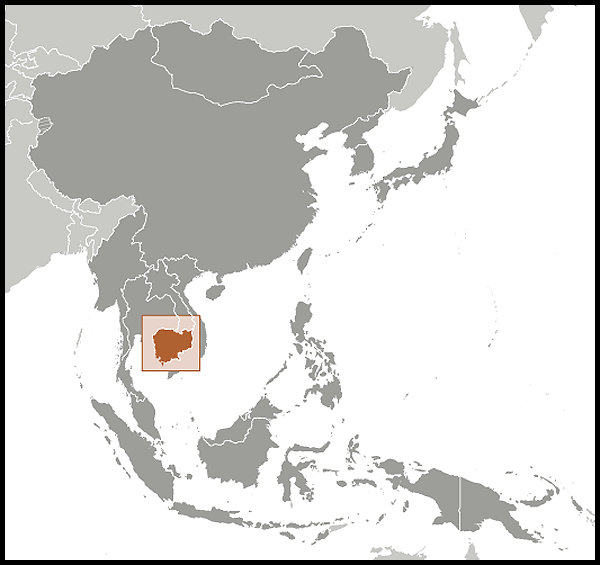 Khmer is the official language and is spoken by more than 95% of the population. Some French is still spoken in urban areas, and English is increasingly popular as a second language. On New Year's Day 1975, communist troops launched an offensive that, in 117 days of the hardest fighting of the war, destroyed the Khmer Republic. Simultaneous attacks around the perimeter of Phnom Penh pinned down Republican forces, while other Khmer Rouge units overran fire bases controlling the vital lower Mekong resupply route. A U.S.-funded airlift of ammunition and rice ended when Congress refused additional aid for Cambodia. Phnom Penh surrendered on April 17, 1975 — 5 days after the U.S. mission evacuated Cambodia. Many Cambodians welcomed the arrival of peace, but the Khmer Rouge soon turned Cambodia — which it called Democratic Kampuchea (DK) — into a land of horror. Immediately after its victory, the new regime ordered the evacuation of all cities and towns, sending the entire urban population out into the countryside to till the land. Thousands starved or died of disease during the evacuation. Many of those forced to evacuate the cities were resettled in new villages, which lacked food, agricultural implements, and medical care. Many starved before the first harvest, and hunger and malnutrition — bordering on starvation — were constant during those years. Those who resisted or who questioned orders were immediately executed, as were most military and civilian leaders of the former regime who failed to disguise their pasts. Within the CPK, the Paris-educated leadership — Pol Pot, Ieng Sary, Nuon Chea, and Son Sen — was in control, and Pol Pot was made Prime Minister. Prince Sihanouk was put under virtual house arrest. The new government sought to restructure Cambodian society completely. Remnants of the old society were abolished, and Buddhism suppressed. Agriculture was collectivized, and the surviving part of the industrial base was abandoned or placed under state control. Cambodia had neither a currency nor a banking system. The regime controlled every aspect of life and reduced everyone to the level of abject obedience through terror. Torture centers were established, and detailed records were kept of the thousands murdered there. Public executions of those considered unreliable or with links to the previous government were common. Few succeeded in escaping the military patrols and fleeing the country. Solid estimates of the numbers who died between 1975 and 1979 are not available, but it is likely that hundreds of thousands were brutally executed by the regime. Hundreds of thousands more died from forced labor, starvation, and disease — both under the Khmer Rouge and during the Vietnamese invasion in 1978. Estimates of the dead range from 1.7 million to 3 million, out of a 1975 population estimated at 7.3 million. In mid-1978, Vietnamese forces invaded Cambodia, advancing about 30 miles before the arrival of the rainy season. In December 1978, Vietnam announced formation of the Kampuchean United Front for National Salvation (KUFNS) under Heng Samrin, a former DK division commander. It was composed of Khmer communists who had remained in Vietnam after 1975 and officials from the eastern sector — like Heng Samrin and Hun Sen — who had fled to Vietnam from Cambodia in 1978. In late December 1978, Vietnamese forces launched a full invasion of Cambodia, capturing Phnom Penh on January 7, 1979 and driving the remnants of Democratic Kampuchea's army westward toward Thailand. Vietnam's occupation army of an estimated 180,000 troops was posted throughout the country from 1979 to September 1989. The Heng Samrin regime's 30,000 troops were plagued by poor morale and widespread desertion. Resistance to Vietnam's occupation was extensive. A remainder of the Khmer Rouge's military forces eluded Vietnamese troops and established themselves in remote regions. A non-communist resistance movement consisting of groups that had been fighting the Khmer Rouge after 1975 — including Lon Nol-era soldiers — coalesced in 1979-80 to form the Khmer People's National Liberation Armed Forces (KPNLAF), which pledged loyalty to former Prime Minister Son Sann, and Moulinaka (Movement pour la Liberation Nationale de Kampuchea), loyal to Prince Sihanouk. In 1979, Son Sann formed the Khmer People's National Liberation Front (KPNLF) to lead a political struggle for Cambodia's independence. Prince Sihanouk formed his own organization, National United Front for an Independent, Neutral, Peaceful, and Cooperative Cambodia (FUNCINPEC), and its military arm, the Armee Nationale Sihanoukienne (ANS) in 1981. From July 30 to August 30, 1989, representatives of 18 countries, the four Cambodian parties, and the UN Secretary General met in Paris in an effort to negotiate a comprehensive settlement. They hoped to achieve those objectives seen as crucial to the future of post-occupation Cambodia — a verified withdrawal of the remaining Vietnamese occupation troops, the prevention of the return to power of the Khmer Rouge, and genuine self-determination for the Cambodian people. A comprehensive settlement was agreed upon on August 28, 1990. In 1997, most of the remaining Khmer Rouge fighters accepted a government amnesty and laid down their arms, putting an end to nearly 3 decades of war. On October 4, 2004, the Cambodian National Assembly ratified an agreement with the United Nations on the establishment of a tribunal to try senior leaders responsible for the atrocities committed by the Khmer Rouge. The tribunal held its first trial, against former S-21 prison chief Kaing Guek Eav (aka Duch), in 2009, resulting in a guilty verdict and a 35 year sentence in July 2010. Duch will serve 19 years after his sentence was reduced by five years for being illegally detained by a Cambodian Military court, and by 11 years for time served since his 1999 arrest. Four more former Khmer Rouge leaders are currently being tried, and two additional investigations are in progress that may result in additional indictmentrs. Donor countries have provided over $100 million to date in support of the tribunal, including $6.8 million from the United States. The executive branch comprises the king, who is head of state; an appointed prime minister; 10 deputy prime ministers, 16 senior ministers, 26 ministers, 206 secretaries of state, and 205 undersecretaries of state. The bicameral legislature consists of a 123-member elected National Assembly and a 61-member Senate. The judiciary includes a Supreme Court, lower courts, and an internationalized court with jurisdiction over the serious crimes of the Khmer Rouge era. Administrative subdivisions are 23 provinces and 1 municipality. While the post-1993 period was relatively stable in comparison to the previous decades, political violence continued to be a problem through the 1990s. In 1997, factional fighting between supporters of Prince Norodom Ranariddh and Hun Sen broke out, resulting in more than 100 FUNCINPEC deaths and a few Cambodian People's Party (CPP) casualties. Some FUNCINPEC leaders were forced to flee the country, and Hun Sen took over as Prime Minister. FUNCINPEC leaders returned to Cambodia shortly before the 1998 National Assembly elections. In those elections, the CPP received 41% of the vote, FUNCINPEC 32%, and the Sam Rainsy Party (SRP) 13%. Due to political violence, intimidation, and lack of media access, many international observers judged the elections to have been seriously flawed. The CPP and FUNCINPEC formed another coalition government, with CPP the senior partner. Cambodia's first commune elections, held in February 2002 to select chiefs and members of 1,621 commune (municipality) councils, also were marred by political violence and fell short of being free and fair by international standards. National Assembly elections in July 2003 failed to give any one party the two-thirds majority of seats required under the constitution to form a government. A political stalemate ensued which was not resolved until July 2004, when the National Assembly approved a controversial addendum to the constitution in order to require a vote on a new government. The National Assembly then approved a new coalition government comprised of the CPP and FUNCINPEC, with Hun Sen as Prime Minister and Prince Norodom Ranariddh as President of the National Assembly. The SRP, with support from various non-governmental organizations (NGOs), asserted the addendum was unconstitutional and boycotted the vote. In February 2005, the National Assembly voted to lift the parliamentary immunity of three opposition parliamentarians, including SRP leader Sam Rainsy, in connection with lawsuits filed against them by members of the ruling parties. One of the parliamentarians, Cheam Channy, was arrested and later tried, while Sam Rainsy went into self-imposed exile. In October 2005, the government arrested critics of Cambodia's border treaties with Vietnam and later detained four human rights activists following International Human Rights Day in December. In January 2006, the political climate improved with the Prime Minister's decision to release all political detainees and permit Sam Rainsy's return to Cambodia. Following public criticism by Hun Sen, Prince Ranariddh resigned as President of the National Assembly in March 2006. He later broke with FUNCINPEC and founded a new party, the Norodom Ranariddh Party (NRP). In 2007, Ranariddh was convicted of corruption by a Cambodian court and fled to Malaysia to avoid imprisonment. In October 2008, he received a royal pardon and returned to Cambodia. Shortly afterward, he announced that he was withdrawing from politics. However, in December 2010 Ranariddh announced plans to re-enter politics, and the Nationalist Party reverted to its former name, the Norodom Ranariddh Party (NRP), with Ranariddh as its leader. Cambodia's second commune elections were held in April 2007, followed by National Assembly elections in July 2008. In both cases, there was little of the pre-election violence that preceded the 2002 and 2003 elections. Both polls resulted in victories for the Cambodian People's Party, with the Sam Rainsy Party emerging as the main opposition party and the royalist parties showing weakening support. The Assembly inaugurated in September 2008 is led by a coalition of the CPP (90 seats) and FUNCINPEC (2 seats). The SRP (26 seats) and the Human Rights Party led by Kem Sokha (3 seats) are in opposition. The NRP (2 seats) has announced its intention to merge with FUNCINPEC by 2012. The CPP-led coalition retained Hun Sen as Prime Minister, as well as most of the key leaders from the previous government, and all ministers are from the CPP. In May 2009, non-universal elections were held when commune council members chose representatives to district councils, city councils, and provincial councils, which would have administrative and budgetary powers at the local level. In 2009, the CPP-dominated parliament voted again to lift the parliamentary immunity of three members of the opposition, including Sam Rainsy, in order to allow civil or criminal charges to be pursued. Sam Rainsy was convicted in absentia and sentenced to tenyears prison in January 2010 for his role in the removal of several temporary border markers on the Cambodia-Vietnam border, along with making statements deemed racially incendiary. He remains outside the country. A second SRP member was convicted of defaming the Prime Minister; after refusing to pay the court-ordered fine and exhausting all appeals, the court ordered the lawmaker's salary garnished to pay the fine, a process which concluded in December 2010. The member began advocating for restoration of parliamentary immunity in January 2011. A third SRP member was ultimately acquitted on all charges. The 1993 constitution provides for a wide range of internationally recognized human rights, including freedom of the press. While freedom of the press has improved markedly in Cambodia since the adoption of the constitution, limitations still exist on mass media. Much of the written press, while considered largely free, has ties to individual political parties or factions and does not seek to provide objective reporting or analysis. Cambodia has an estimated 25 Khmer-language newspapers that are published regularly. Of these, eight are published daily; three opposition papers are published regularly and two of these are daily publications. There are two major English-language newspapers, two of which are dailies. Broadcast media, in contrast to print, is more closely controlled. It tends to be politically affiliated with the CPP, and access for opposition parties is extremely limited. Cambodia's embassy (http://www.embassyofcambodia.org/) in the United States is located at 4530 16th Street NW, Washington DC 20011; tel: (202) 726-7742; fax: (202) 726-8381. From 2001-2010, the Cambodian economy expanded by, on average, 8% per year, with the garment sector and the tourism industry driving the growth, and inflation remaining relatively low. The onset of the global recession led to a 0.1% contraction in 2009, but growth resumed in 2010 at 5.95%. The economy is heavily dollarized; the dollar and riel can be used interchangeably. Cambodia remains heavily reliant on foreign assistance — about half of the central government budget depends on donor assistance. Foreign direct investment (FDI) has increased 12-fold since 2004 as sound macroeconomic policies, political stability, regional economic growth, and government openness toward investment attract growing numbers of investors. Manufacturing output is concentrated in the garment sector, and garments dominate Cambodia's exports, especially to the U.S. and the EU. The industry expanded rapidly from the mid-1990s until 2008, employing 350,000 workers and generating $3 billion in annual revenue at its peak. The global economic slowdown caused a drop in demand, resulting in a more than 20% decline in garment exports and an estimated 60,000 unemployed workers from late 2008 through 2009. In 2010, the garment sector grew 15%. Employment in the sector and garment exports are expected to reach pre-crisis levels in 2011. Tourism levels, which increased to approximately two million arrivals in 2008 but were also hurt by the global downturn, rebounded to 2.15 million arrivals in 2010. The service sector is heavily concentrated in trading activities and catering-related services. The real estate sector contracted by 15.8% and land prices declined 10%-15% in 2010. Both commercial bank credits and deposits grew between 20%-25% in 2010. Exploratory drilling for oil and natural gas began in 2005, and commercial production is expected to commence in late 2012, but it is not yet clear if commercial extraction is viable long-term or how large Cambodia's reserves are. In spite of recent progress, the Cambodian economy continues to suffer from the legacy of decades of war and internal strife. Per capita income and education levels are lower than in most neighboring countries. Infrastructure remains inadequate, although road networks are improving rapidly. Most rural households depend on agriculture and its related subsectors. Corruption and lack of legal protections for investors continue to hamper economic opportunity and competitiveness. The economy also has a poor track record in creating jobs in the formal sector, and the challenge will only become more daunting in the future since 50% of the population is under 20 years of age and large numbers of job seekers will begin to enter the work force over the next 10 years. In the past 3 years, bilateral relations between the U.S. and Cambodia have deepened and broadened. With the lifting of a congressional ban to provide direct assistance to the Cambodian Government, more direct technical assistance has become feasible. U.S. assistance to Cambodia administered by the U.S. Agency for International Development (USAID) mission in 2010 totaled approximately $70 million for programs in health, education, governance, and economic growth. The U.S. supports efforts in Cambodia to combat terrorism, reduce the prevalence of HIV/AIDS, build democratic institutions, promote human rights, foster economic development, eliminate corruption and trafficking in persons, achieve the fullest possible accounting for Americans missing from the Indochina conflict, and to bring to justice those most responsible for serious violations of international humanitarian law committed under the Khmer Rouge regime. The Embassy's website at http://cambodia.usembassy.gov/ (http://cambodia.usembassy.gov/) and the USAID Mission Cambodia website at (http://www.usaid.gov/kh/) provide up-to-date information about U.S. Government activities in Cambodia.